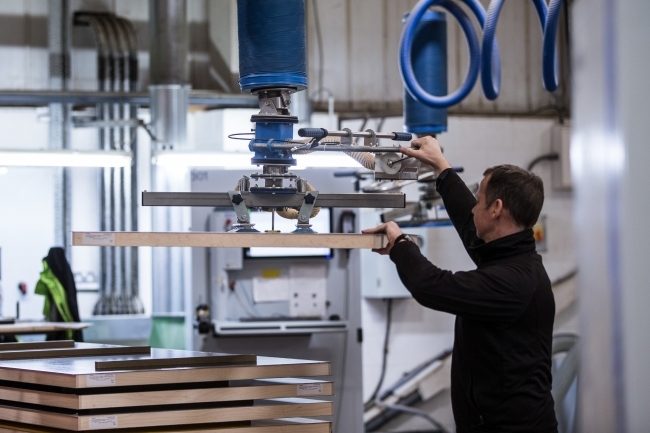 David Smith St Ives Ltd is a leading UK manufacturer of high performance engineered timber products whose output is totally dependent upon an uninterrupted supply of plant air and vacuum. By replacing ageing stand-alone units with a centralised rotary screw VSD vacuum pump system from Atlas Copco’s distributor, Anglian Compressors, production continuity has been assured and 40 per cent savings in energy costs realised. Established in 1963, the family-owned and managed business occupies a purpose built 165,000 sq. ft. manufacturing plant on the outskirts of St Ives, Cambridge. From there the company utilises modern production techniques together with traditional craftsmanship to produce a range of high quality bespoke staircases, roof trusses, engineered joists, Glulam and door-sets. The company’s precision manufacturing capabilities enable it to fulfil large commercial orders as well as offer one-off bespoke products for house builders, housing associations and commercial contractors. Product development frequently involves working in both public and private sector projects alongside architects, structural engineers, surveyors, and specialist contractors. Each product division has its own design team, using the latest CAD software to prepare technical drawings and product specifications. These designs are then programmed directly into specialist machinery to produce each component. 5-axis CNC routers are key production units in the manufacturing process cycle and rely on vacuum to clamp and unclamp work pieces. 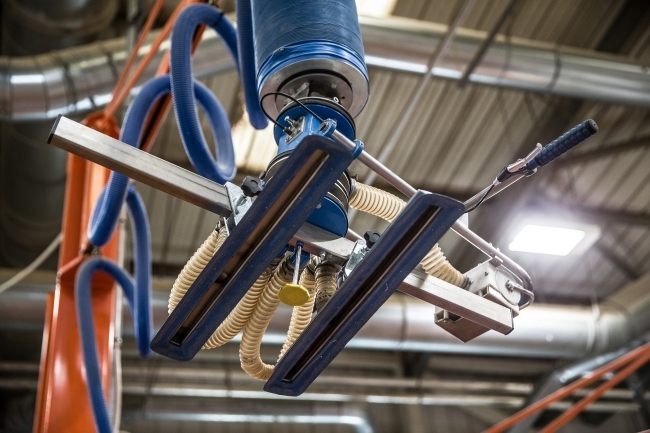 Before the centralised vacuum system was installed, the company had operated over the past twenty years with a system of eight vane-type vacuum pumps, two feeding each of the four CNC machining centres. The system of allocating a 5 kW pump and a standby unit at the point of use to each machining centre was not the ideal solution to prevent the risk of downtime, as the company experienced when two pumps broke down in close succession. The incident was the catalyst that prompted an investigation into the potential advantages offered by deploying a centralised system based on the latest developments in rotary screw vacuum pump technology. Consequently, Peterborough-based Atlas Copco premier distributor, Anglian Compressors, who earlier had supplied the company’s GA air compressor, was called upon for recommendations. Anglian undertook an air system audit and in-depth investigation into David Smith St Ives’ production processes to see how compressed air and vacuum were utilised; with a view to improving energy efficiency and equipment reliability as well as reducing service costs. Their recommendation was a centralised rotary screw VSD vacuum pump system. Rotary screw vacuum pumps are based on proven compressor screw technology and provide significantly higher performance levels and reduced maintenance, noise and heat emissions compared to conventional oil-sealed and dry vane vacuum pumps. With the application of variable speed drive, it’s possible to tailor vacuum production to precisely meet process demand, as the new system installed by Anglian Compressors clearly demonstrated. 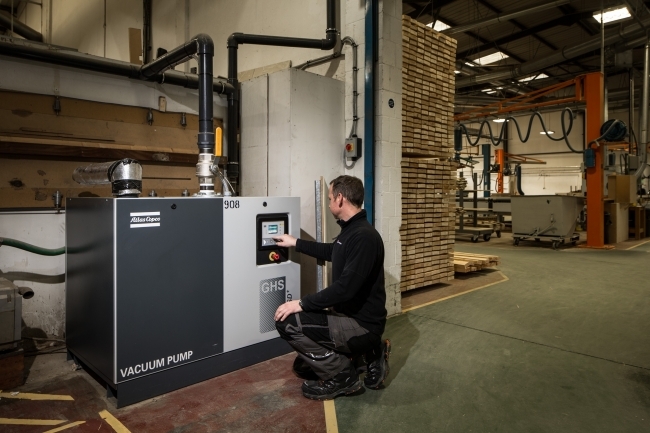 The GHS VSD+ pump was connected to a new ring main installed by the customer and to all concerned the performance results were impressive. Whereas the former eight stand-alone pumps were each individually demanding 5 kW shaft power 100 per cent of the time, regardless of fluctuating operational demand, the new, complete 15 kW system with VSD was coping at only a 60 per cent load for 97 per cent of the time throughout a 68-hour production week. The net result was a 40 per cent reduction in energy demand. As for the redundant standby rotary vane units, they are now linked into the system as back up for critical equipment during scheduled service periods provided under the 5-year Atlas Copco Total Responsibility maintenance contract.